This 16-summary of where the industry is coming from and where it is going mainly gives an interesting perspective on geographic developments in the mining industry. The report shows how center of mining activity has shifted from Europe, via the US, to the BRIC countries and new frontiers. At the same time the report illustrates how a large part of processing capacity still is located in the developed world, though China’s processing surge is instrumental in changing this situation. China-led nationalized mining is leading to a global increased in state participation in mining companies. The mineral production value as percentage of GDP. The top 25 countries according to the ranking with their respective scores are displayed below. “Zambia’s new government has suspended metal export permits as it prepares new guidelines for the sector of Africa’s biggest copper producer. The decision followed concerns that copper exporters had not been paying their full duties to the state and is seen as an attempt to improve transparency in the industry. But it is also the latest in a number of sweeping measures by President Michael Sata’s administration, including the threat of higher mining taxes, as he looks to stamp his mark on the country after winning September 20 elections. Zambia’s new president promised to strengthen control over the country’s mining sector, responding to unrest in the country about the actions of foreign mining companies. Zambia accounts for approx. 5% of global copper production with a significant potential to grow. First Quantum’s Kansanshi copper mine is among the world’s top 20 in terms of output. Only one-tenth of the tax revenue comes from copper, though three-quarters of export earnings are from copper. Resource nationalism is a key issue in the mining business this year, driven by high commodity prices and economic uncertainty. Just this week the news featured Vale’s potential agreement with the Guinean government about Simandou ownership and the request and withdrawal of the same request of Mongolia’s government to review the ownership of Oyu Tolgoi, developed by Rio Tinto. The concerns of the chamber of mines about contractual obligations with exporters and transporters are not very fundamental. All the parties in the mining value chain benefit from high copper production, making it easy to find a modus operandi while the uncertainty lasts. However, the industry in Zambia will have to prepare itself for negotiations about higher taxes as the new government will try to gain popular support by transferring more of the profits from the country’s natural resources to the people. “Rio Tinto, the Anglo-Australian mining group, is re-entering the potash business through a joint venture with a Russian fertiliser producer which holds extensive exploration permits in the Canadian province of Saskatchewan. “Mining heavyweight BHP Billiton is “aggressively” pursuing potash projects in Saskatchewan along with its Jansen asset, the company said on Wednesday. “Although these are at an early stage, the data acquired suggests they have the ability to support significant potential developments,” spokesperson Ruban Yogarajah said, adding that the combined properties could “at least” match Jansen’s planned output of eight-million tons a year. Approx. 33mln tons of potash are mined annually, with Canada accounting for approx. 30% of global production. With price per ton of around $400-$500 the global market totals $13-17bln annually. Both BHP Billiton and Rio Tinto are planning to move or expand in the Potash industry. BHP Billiton already is operating in Saskatchewan and tried to make a big move by taking over PotashCorp last year. Rio Tinto sold its potash exploration projects in 2009, but tries to re-enter in a JV with a small Russian player. The potash market it currently dominated by 2 marketing ‘cartels’: Canpotex (PotashCorp, Mosaic, Agrium) and BPC (Belarusian Potash Company: Silvinit & Uralkali), which control close to three quarters of global sales and typically copy each others pricing agreements with large customers. The rise of the large diversified players in the business (apart from BHP and Rio, Vale is also building its potash business) could break the power of these cartels and might move the market to pricing based more on spot prices. From a technology and production standpoint it makes a lot of sense to have diversified mining companies, specialized in running large scale extraction projects, operate potash mines. Only on the marketing and sales side of the business synergies will be hard to realize, but companies like BHP and Rio Tinto have the experience and size required to set up a strong marketing presence. “An internal review at Eurasian Natural Resources Corp, launched after of a corporate governance debacle that saw two directors ousted at the mining company’s annual meeting, has left the management and board almost unchanged. Johannes Sittard, chairman and former chief executive, remains chairman. Felix Vulis, who resigned in February citing commitments in his family life, has been restored as permanent chief executive. One of ENRC’s founders, mr. Alexander Mashkevich, was rumoured to be interested to take over the presidency of the company. However, within days of the publication of this story the results of the review were announced. The review restored a majority of independent board members for the company, which was lost after various board members left or were not reelected earlier this year in a power struggle in the board. In the current situation about 70% of the shareholders are not represented in the board. This might lead to disagreement between board and shareholders in the case of a potential takeover bid. In June Glencore was said to be interested in buying ENRC, which has lost a lot of market value in the past year. The Kazakh government and Kazakhmys together hold close to 40% of the shares. Both parties will not be in favor of the 3 founders (the Troika) gaining more control over the company and will be happy mr. Mashkevich does not join the board. “Brazilian mining company Vale SA said Thursday it struck a two-year collective labor accord with all of the country’s mining workers’ unions. The accord will give Vale employees an 8.6% pay rise effective November and a further 8% pay increase in November 2012, Vale said in a statement. In addition, the employees will get a bonus each year of 1,400 Brazilian reais ($744.68), the company said. Out of 71 thousand of Vale’s employees (Dec 31 2010) approx. 60 thousand work in Brazil. The agreement holds the middle between Vale’s initial 7.5%/y offer and the union’s ‘15%/y plus bonuses’ demands. In previous years Vale gave a 7% increase annually. Inflation rate in Brazil has been around 5-6% over the past years. Creative bonus systems will become a more important part of the mining remuneration policies because skilled resources and talent are becoming increasingly scarce in the mining industry. Brazil’s National Mining Plan foresees growth of the domestic iron ore production of 58% from 2011 to 2015. Current high ore prices will help to finance aggressive expansion, but the legislative processes around development and the shortage of workers form two important obstacles to realize this objective. BHP positions itself in the cost curve around $39/t CIF. 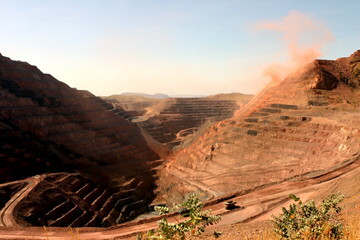 Average iron ore price for the year ended June 2011 was $163/t, resulting in a 76% operating margin.